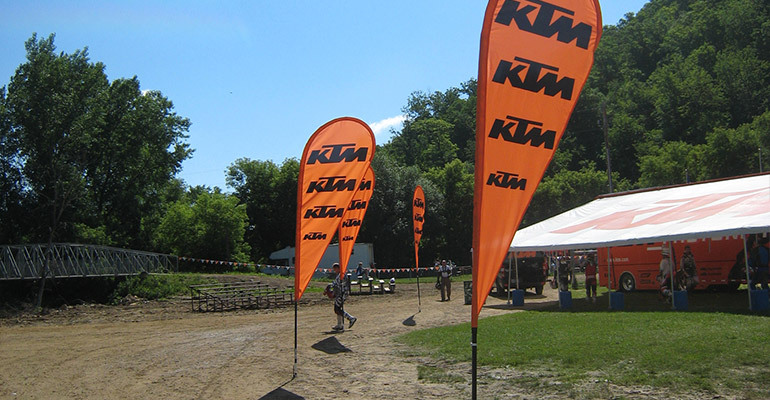 Great solution for outdoor advertising, Start/Finish lines, Team tents, etc.. The Blade flag is available in 2 sizes: Grande (116″ x 51″) and Petite (58″ x 33″). The Grande and Petite Blade Flags can be used free standing or attached to your canopy legs to enhance your overall presence. Allow 10 business days for production AFTER artwork is approved. NOTE: If you include your text in your Photoshop file, your resolution will need to be higher than this in order to assure that the text looks as clean as possible. Flatten or rasterize text whenever possible. All files need to be setup at 25% (1:4 scale) of actual size (for example, a 16” x 32” sign should be laid out in a 4” x 8” document). Files with bleeds need to have a minimum bleed size of 3/4”. Photoshop files need to be 300dpi at 25% of actual size. Any art scans placed within a layout aplication, such as InDesign or Quark, should be placed in the document as an .eps at 70-100% scale. All Adobe Illustrator, and CorelDRAW files must have the fonts converted to outlines or paths. All fonts used in an InDesign or Quark document must be provided, both screen and printer fonts. We require a .pdf of the final artwork to ensure that the final digital output matches your original file. If you need the output color to be extreamly accurate, we require you to supply us with specific PMS colors. (.jpg, .bmp, . gif ) These are formats usually formated for web design. These can only be accepted if the resolution is at least 150-300dpi and in CMYK color. NOTE: If you are taking an image from a website it WILL NOT WORK. Photos from websites are formatted from the originals to be as small as possible so web pages can load quickly. These files are too small for print. If you are taking pictures from a digital camera to send to us for output, your camera settings must be at “High” or “Best” resolution. Digital photos under 5MP usually do not work for large format output. If you have a small digital file, DO NOT open the photo in a photo editing program and change the resolution (dpi) to make the photo larger. There is no way to ADD resolution to a photo that has already been taken, all that happens is you take a bad photo and make it larger in size. Please retake the photo or find an alternative. If your digital camera does not take photos at a print acceptable resolution, then you must use a traditional film camera and either scan the photo or send us the developed glossy print to scan. We DO NOT print from or accept layouts for print in the following formats, except for importing text into an actual design program: MS Publisher, MS Word, MS Powerpoint, MS Excel. We DO NOT take native .cdr files! For any questions or other flag types available, please contact us.